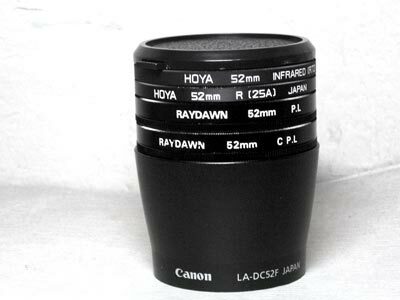 So I bought a 52mm Raydawn linear polarizer for yet more photography experiments. Who cares that I went to Zouk on Wednesday, Hartamas on Friday and Saturday, and Midvalley on Sunday? Who cares that I wassup guys that girls had major crushes on since Form 2 (no, not you, stim-girl)? Well, apparently, nobody, so I’ll just put more trippy pictures. At least you guys tell me you think it’s cool, even though you don’t comment. Anyway, in the arrangement of camera, linear polarizer, circular polarizer, I was able to get a manual white balance of varying precision! The right-most picture is without both polarizers on. The other two are the extremities of blue-ness and orange-ness I can get by turning the circular polarizer only. 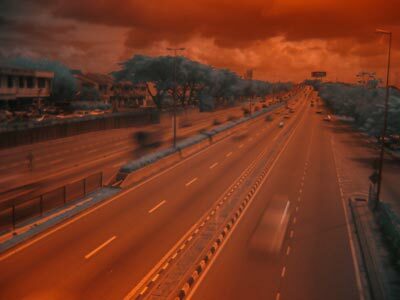 Turning both (meaning you turn the linear polarizer) will function as a normal polarizer. 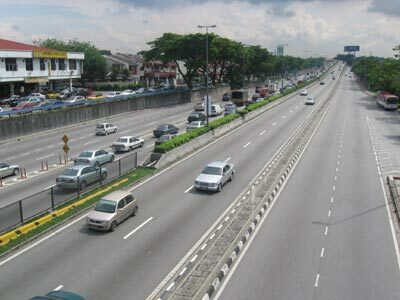 We now bring you to Site A, on the pedestrian bridge of the Kelana Jaya PUTRA LRT station. I took the following pictures between 11:10am and 11:30am. No, I do not go out just to take pictures; I was waiting for the bus. 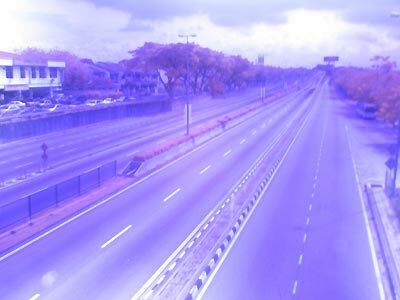 The recorded shutter speed was 1/250 seconds, F8. Now we get funky! 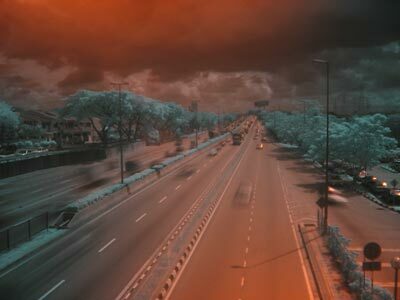 In the order of camera, circular polarizer, linear polarizer you get something like an infrared filter. Turning the circular polarizer functions as a normal polarizer. I had to use Manual mode, F8, 10 seconds to get about the same histogram. 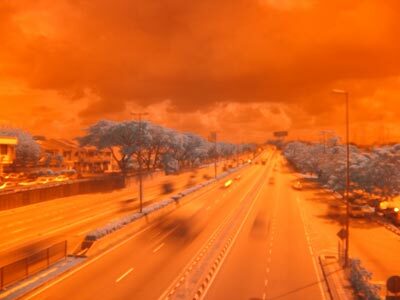 Now, insert a red filter, so the order is camera, circular polarizer, red filter, then linear polarizer. Fiddling around, the infrared-glowing objects are distinguished by varying levels of redness. This was 1/3 second, F2.6 (equivalent to F8.0 at 2.66 seconds). Note that at certain angles, there is a stain of color on certain edges of the circle. I do not know the science behind this, but snap in black and white and you won’t see it. I don’t remember which angles they were, so just play around with both dials to get effects. The only picture with any levels adjustment was the first one. The others are only sharpen and resize. Load the pictures into Photoshop and hit Auto Levels to see what they could become! 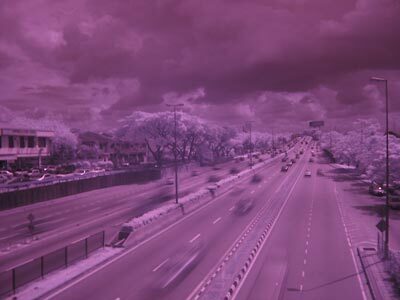 In case you forgot what a normal infrared picture looks like, here’s one with just the Hoya R72 filter. Left: 1/2 seconds F2.6 with camera then CPL then PL, 1/2000 seconds F4.0 (or 1/4000 seconds F2.6) without filters on Shutter priority mode. That makes a 2000x ND, 11 stops. The geekier among thou would have noticed that going from 1/250 to 10 seconds (in the fourth picture) is a slowing down of 2500x. That would be equivalent to a neutral density filter of 2500x, or over 11 stops! Add that you have the flexibility of dialling in the density! 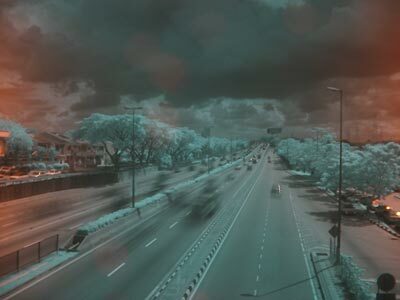 Of course, neutral density filters do not stain the picture or change its color; so, when dialling in, it goes from a neutral density filter of 4x and ends as an violet-tinted infrared filter. The sweet spot in between, where color is not changed, might be less. This entry was posted in Geek, Pictures on November 27, 2005 by 2konbla. Jealous of you going out so much. I’m sick and have been stuck indoors… sigh.